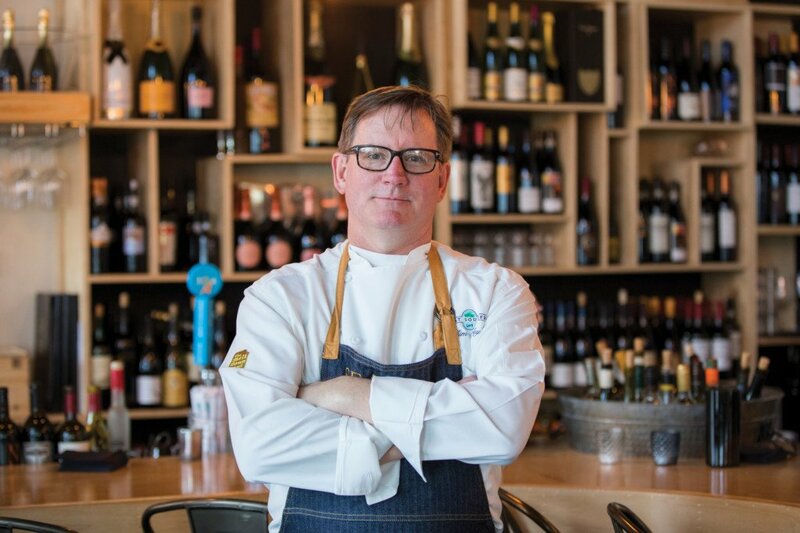 Jim Shirley is an award-winning chef, philanthropist and owner of the Great Southern Café, 45 Central and The Meltdown on 30A in Seaside; The Bay in Santa Rosa Beach; and Baytowne Provisions in Destin. He is co-owner of the Great Southern Restaurants company of Pensacola and currently resides in Santa Rosa Beach. 850 Business Magazine: You’re hailed as a master of modern Southern cuisine. How do you go about putting a contemporary twist on traditional flavors? Jim Shirley: At its heart, Southern cuisine is an amalgamation of influences from all the different groups — be it the West Africans or French Acadians — that settled in the South. I was born in Pensacola. Both of my parents’ families are from Georgia, so I have a rock-solid, Southern foundation. But, growing up, my father was in the Navy. Our diet was dictated by wherever we were stationed, whether it was German cuisine in Frankfurt, or Asian dishes from Vietnam and the Pacific realms. I still have a military-issue cookbook that dates to the 1960s, where soldiers stationed from all over compiled these little hidden gems. I do the same thing and like to think of it as improving upon an old presentation without losing the core of its flavor. 850: Your own cookbook, Good Grits! Southern Boy Cooks, features many heartwarming, country classics. What’s your go-to comfort food? JS: I can always go for a nice piece of fish. Whatever’s in season, served with a big helping of greens, is always going to ground me. It’s a plate-licker. JS: Okay, I have a weakness for pig skins. At the Bay, we fry ’em up fresh and serve them with some of my homemade Hog Island sauce and Asian chili sauce. It’s always good to top them off with a sprinkle of sea salt and cayenne. 850: The Bay is just one of numerous restaurants you have along the Emerald Coast. What’s a typical work day like for you? JS: First thing in the morning, I like to do a quick tour of the restaurants in Seaside and Santa Rosa Beach. I’ll meet with my chefs and give them a rundown of what’s going on that day, but they don’t need much direction. The reason I’m able to keep up with several restaurants is because I have great, capable talent working for me. We’re very project-driven. This morning, we have a smoker rollin’ at The Bay just for kicks. We like to play around and keep things interesting, but we also cater to many events, which take months of preparation. It all just depends on the day. 850: Some days you even find yourself at the James Beard House in New York City. JS: My chefs from Pensacola and I have been invited to cook there five times. It’s always a lot of pressure but a terrific experience. You have the facility for one day: At 8 in the morning, they open the door, you unload all your equipment and get cooking. By 5 o’clock, the cameras turn on, and we remember we’re in James Beard’s old brownstone, not the 100-year-old cracker cottage we’re used to cooking in at the Fish House. There are a lot of eyes — powerful eyes — on you, but it’s so special to be able to bring everyone a little slice of the Panhandle. 850: You’ve also served Spanish royalty and numerous other celebrities. What occasions do you consider to be the most memorable of your career? JS: Oh, teaming up with all the great chefs of Pensacola to prepare dinner for the king and queen of Spain was a lot of fun. We were celebrating the 450th anniversary of the founding of Pensacola, so it was a huge occasion. I’ve also had the honor of representing Florida in the Great American Seafood Cook-Off, but as far as recent events go, last year’s Seeing Red Wine Festival in Seaside comes to mind. Between all the wonderful wine, wagyu beef and crazy hams from Iberia, we used an 8-foot pan to prepare paella for 1,600 people. Maneuvering 700 pounds of seafood and rice was a workout, but the pan remains really efficient. 850: There are other uses for the 8-foot pan? JS: After Hurricane Michael, we used it to prepare food for people in Port St. Joe. We thought it would be best to move some catering tools over there and establish a mobile kitchen that local restaurants could take turns using. That way, we could keep the hot meals coming throughout the week. I had restaurants get knocked out by Ivan. When Katrina happened, we would wheel spaghetti into Biloxi every day and feed thousands. After Michael, I knew it would take a while for the big organizations to arrive, so we wanted to help as soon as possible. 850: You also give back through the Children’s Home Society of Florida. JS: The future of our community is going to be the product of what we’ve done with our children — I don’t think that’s optional. The Children’s Home Society has always done a great job of providing the support that, unfortunately, some people need in this region. My role on the board of directors is to use food to promote and sponsor our events, such as the annual Sunday of Soundside Splendor for the Seaside School Half Marathon. Whether it’s seeing children get adopted into new families and taken out of harm’s way, or knowing that our school systems are working just that much better, it’s all very rewarding. 850: Your website mentions you have two other projects on the burner. Can you give us a little taste of what’s to come? Seaside now has its boardwalk license, which means you can walk around freely with cocktails. At the Great Southern Café, we have a new B.F.F. (an addition that makes bushwhackers, frosés and frozen cocktails) that you’ll be able to get from the street. As for the other project, all I can say is it’s very new, very exciting stuff. I’ll keep you apprised.